As we’re getting closer and closer to launch we’re stocking up on the midnight oil and we’re burning it with reckless abandon. These are busy times, hectic times, but also very exciting times. The studio is buzzing with activity and we’re working hard to make sure the game is ready for the grand premiere on PC, PlayStation 4, and Xbox One on May 8th. With only three months to go before the big day, we wanted to take the opportunity to talk to you about how the launch version of Conan Exiles will look. In the past couple of months, we’ve had to make some serious decisions as to what will be in for launch. We’ve been going through every aspect of the game (including things still in development) and we have evaluated everything based on a range of criteria. Some features or content simply ended up not being good enough, some things have ended up not making sense for the game, some things have been replaced with other features and content, while some things just turned out to be out of reach from a technical or development capacity standpoint. When you’re closing in on launch you must make some difficult choices and we’ve been doing a lot of that during the past few months. We’re now at a point where we are able to commit to what’s going to be in for launch and what’s not, and we want to take this opportunity to offer full transparency on what and why. This coming Friday we will be doing another live stream where we will set aside some time to talk about this update. If you have any questions or comments please let us know during the stream and we will try and answer as many questions and address as many comments we can during the stream. 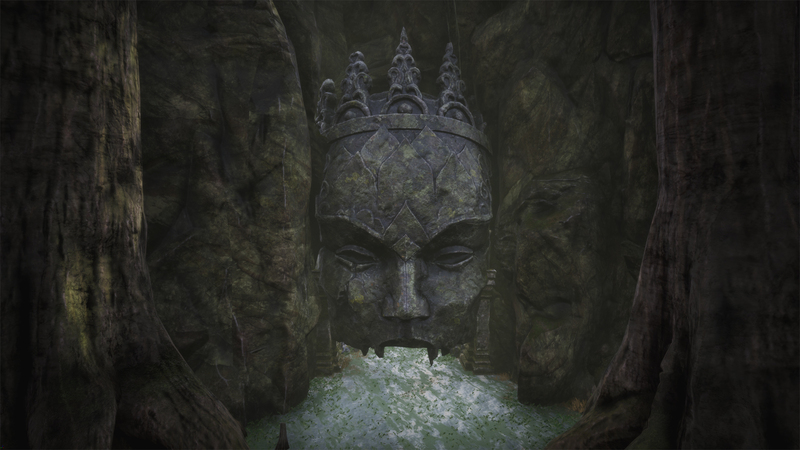 The stream will go live at 5pm CET on Friday February 16th at www.twitch.com/funcom. When we launch Conan Exiles, the world will be twice as big than it was when we first launched Early Access. 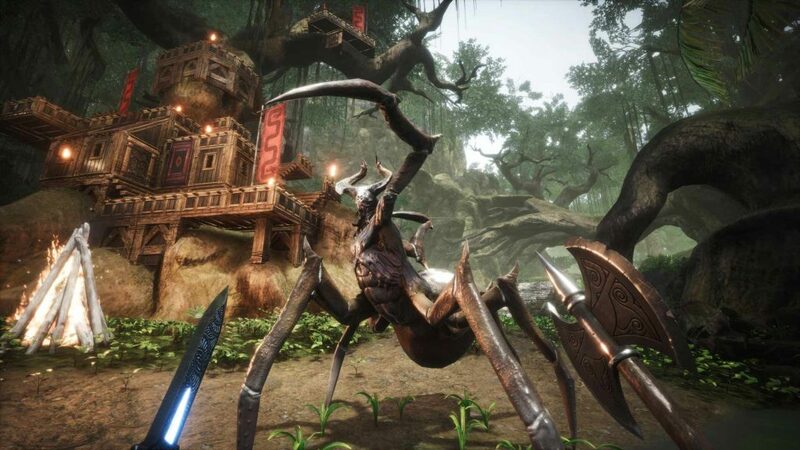 Starting May 8th players will have full access to a vast new swamp biome, full of new monsters, new crafting recipes, weapons and armor, new locations, building materials, and more. 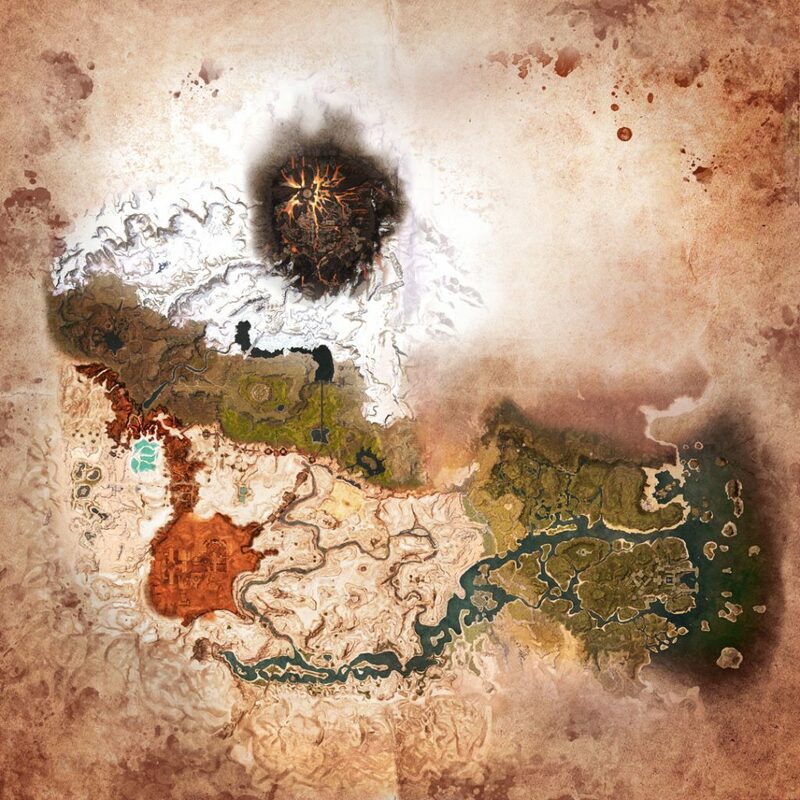 The swamp will be an integrated part of the main map and can be found on the eastern side just above the southern desert. 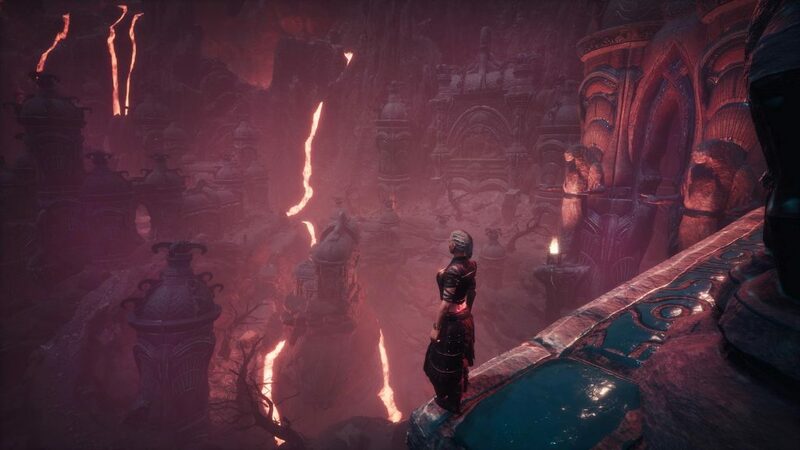 A new volcano biome will also be added to the Frozen North area. When we did our Easter community survey last year, improved combat was the single-most requested feature. In fact, the overwhelming majority told us this should be the number one priority of the development team. Being a game based on Conan the Barbarian and his savage world, melee combat was always something we wanted to make sure was a step above other games in the genre and your feedback confirmed that should be our focus, so we set out to work. The new combat system is a complete and total overhaul. It changes everything. It feels a lot more visceral, it relies on thought and tactics, and most importantly it makes combat a lot more fun. To get an impression of how it all look and plays, check out the recorded livestream above. The new combat system also introduces a brand new HUD and several significant improvements to several of the user interface elements in the game. We will continue to improve and iterate on the HUD towards launch based on the feedback we receive. The purge was one of the features we talked about early on and it’s been important to us to make sure we get it ready simply because it’s a key ingredient to closing the gameplay loop. The purge was initially conceived as NPC armies coming from outside the Exiled Lands to attack players. As we decided that the team working on this should spend more time polishing and optimizing the general AI on all creatures and NPCs in the game, we had to go back and rescope this feature in order to make sure we could launch with a solid implementation. The important thing to close the gameplay loop is to have a purge mechanic that sees creatures or NPCs present a danger to your base. In PvP you already have the danger of players coming in to attack your city, and you need to build smart and you need to set up defenses to keep attackers at bay. In PvE and single-player we haven’t had such a threat, which means there has been a certain lack of meaning to building a fortified base. The purge mechanic at launch will see creatures and NPCs attack your base, even when you’re not logged in, so you need to consider traps, walls, thralls, and other defenses. It can be a lone hyena trying to knock down your door, or it could be a group of bandits coming in to break down your walls. The purge mechanic will be active on all official servers, and private server admins can choose to turn it on or off on their hosted servers. We look forward to showing you more of this as we get closer to launch. If you ever need a respite from the skull-crushing savagery of the barbarian lifestyle, you will be able to enjoy the laidback life of an exiled farmer. At least until the shalebacks come tearing through your crops. In order to farm crops, you’ll need to be able to obtain seeds from the crop you want to farm. Seeds are gained from plants when you use the Sickle. Seeds can then be placed into a Planter to, over time, grow a crop. Each seed results in a total of 10 crops, except for certain specialized crops. You’ll need to power the planters using Fertilizer. 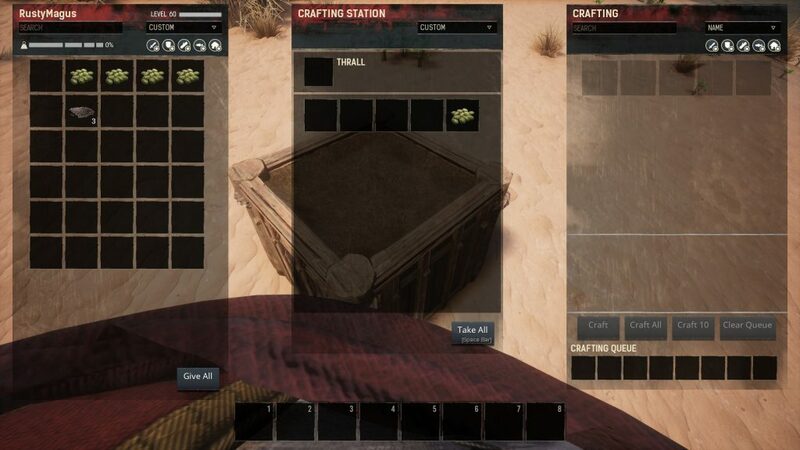 Fertilizer is made in a Compost Heap, which is craftable via the inventory. Certain plants require special Potent Fertilizer, also made in the Compost Heap using special ingredients. All non-aquatic plants can be farmed, as well as the Orange Phykos. We are adding an entirely new religion to the game with a brand new avatar: Derketo! She is a dual-natured goddess who is worshipped in Stygia as the queen of lust and fertility, while feared in the Black Kingdoms as the goddess of death. She is both terrible and beautiful. This addition represents an entirely new religious path, with three tiers of altars and special crafting ingredients and items you can only create when following Derketo. We look forward to showing you more of this as we get closer to launch. War paint is confirmed for launch. You learn about war paint through the Feats window, like most other crafting recipes. You craft war paint using Papyrus, which creates a special pattern that you then apply to your character. There are two kinds of war paint. One is purely visual, with 7 different kinds of cultural styles and patterns you can apply. The other gives you a +3 bonus to one of your attributes. When we revamp the attributes system to include perks, war paint can be used to give you those extra stat points you’ll need to unlock a particular perk. You can only have one pattern on at a time, so remember to choose wisely. Cultural style war paint will last about a week in real time, but stat boosting war paint will fade after about an hour. So, it could be a good idea to pack extra patterns. We know a lot of you really want a way to quickly get around the world, so we’ve gone ahead and added fast travel! Scattered around the world you will discover obelisks and once you have interacted with them you will be able to fast travel to them from your base. 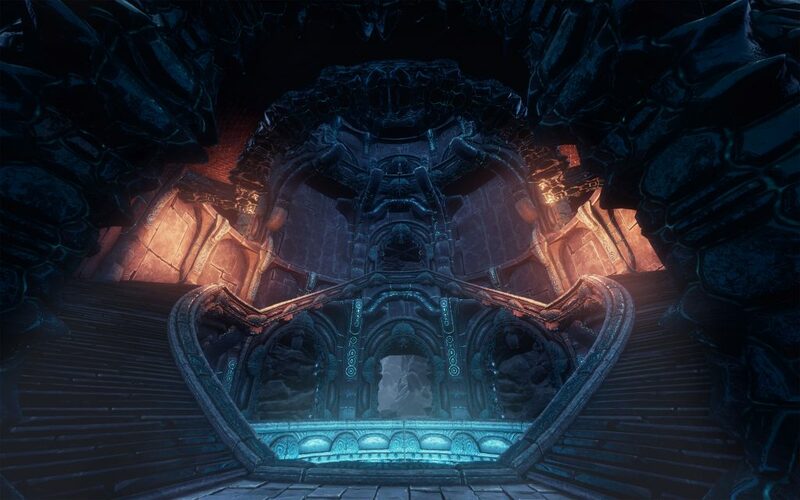 In order to do that you need to build a map room (pictured above), and as you discover more obelisks you will unlock new areas that you can fast travel to. The new perks give you meaningful choices about how to play (and roleplay) the game. As you spend points in abilities, you unlock these powerful perks. Does your character lean towards cannibalism? 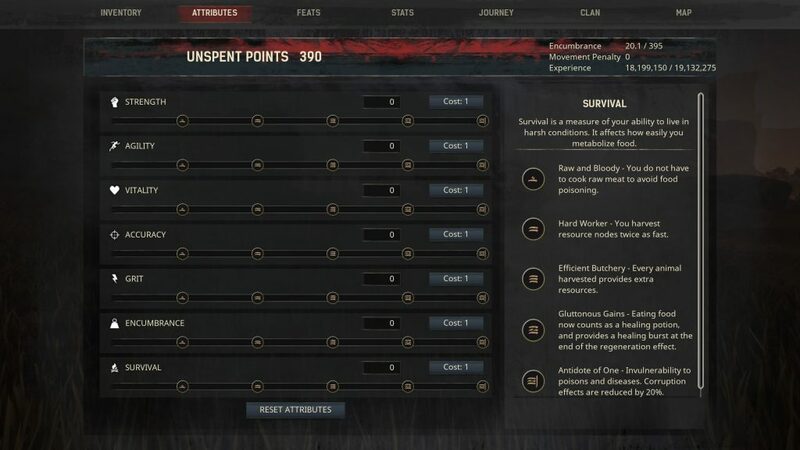 Invest in the Survival tree and gain the “Raw and Bloody” perk – which gives you the ability to consume raw flesh without penalty. Are you playing a nimble warrior? Invest in the Agility tree to learn “Extended Leap” and perform amazing feats of acrobatics. A pack rat? Invest in Encumbrance and learn “Balance and Counterbalance” to convert that extra weight into combat damage. There are 35 perks spread across 7 attributes and you’re going to want them all! There are many other goodies not in the game right now that will be coming in for launch (or even before launch) not listed above. You’ll see stuff like an improved journey interface (allowing you to track your outstanding milestones), new furniture and other placeables, new building pieces, throwable lures to attract monsters you’re hunting, new potions, and much more. We aim to give you a more exhaustive list closer to launch, but in the interest of keeping the “wall of text” factor to a minimum for this update, we’ll leave it at that for now. Unfortunately, we will not be launching with mounts or pets. Mounts were one of the most requested features, and we have spent a lot of time trying to make it work for Conan Exiles. Due to technical limitations with the way the game loads and streams the game world, we were unable to include a feature that allowed players to move over a certain speed. Our coders worked hard to find a solution for this, but in a recent “point of no return” type meeting, we decided that their time is better spent on polish, bug fixes, and other features that we know can make it for launch. Pets is another animal-specific thing we also wanted to do. We have done a lot of the groundwork, and it’s certainly possible that we can add them at some point after launch, but we decided to prioritize polish and other features ahead of launch. There were also concerns about server performance, that too many players having too many animals and human thralls would have a massive impact on servers. To minimize risk for launch and to focus on other core features, we have decided to put this on hold. We started sowing the seeds of sorcery with the release of glass orbs that worked as grenades. Brewing alchemical potions and poisons can also be said to be a kind of sorcery in Conan’s world. We’re expanding the types of potions you can create using alchemy and you’ll also be able to craft special throwable lures to attract specific monsters and creatures. 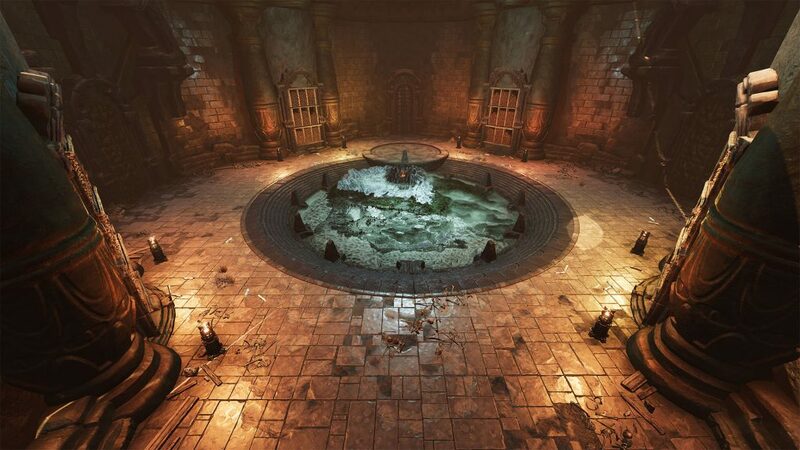 Sorcery, as initially pitched, will not make it into the game, but some elements will. The fast travel system is teleportation magic, but it doesn’t require corruption to fuel it. We have also added explosive and poisonous gas orbs that delivers some of what was planned for the sorcery system. Ultimately, we were in a situation where we could either focus our development capacity on improving the combat system or splitting up the team to work on combat and a fully realized sorcery system. We chose to focus on combat, as we felt that was a more integral aspect of the Conan experience. It was a very difficult decision to make, but now that the new combat system is almost ready, we feel that it was indeed the right decision and that a more fun, tactical, and visceral combat system is something the game really needed. The settlement system was an idea we had early on to add more NPC life to bases, especially on PvE servers. It was never clearly defined, but we had some high-level ideas. Many of the ideas we talked about early on will not be in the game. Some of the ideas were abandoned because we had to prioritize other key areas, the primary example being enemy AI. A lot of the same coders that would have worked on doing AI for city life had to focus on improving the general and combat AI for enemies (which was far from good enough at launch). Thankfully we have made significant strides in that area due to this reprioritization. Keep in mind the version that is live for PC now over two months old and a lot of progress on NPC pathfinding and general AI behavior has been made since then. Some ideas were abandoned because they didn’t work well enough within the framework of the game and some ideas matured into other features that have since been implemented. For instance, a large part of the settlement system was making thralls more interesting and useful, and some of those features we have added during Early Access. You can now for instance dress them up and equip them with weapons you want them to use, and we have added the ability for thralls to follow you around and help you out in sticky situations. At launch you will also see monsters behaving in more interesting ways, such as foraging for food, resting up, and so on. They say ideas are cheap and that execution is the hard part. That’s doubly true for game development. We have had a lot of great ideas both before and during Early Access, and we’re very happy that we have been able to execute on a lot of them. Unfortunately, there have also been ideas that we in our excitement communicated early on that just weren’t possible for us to execute on. 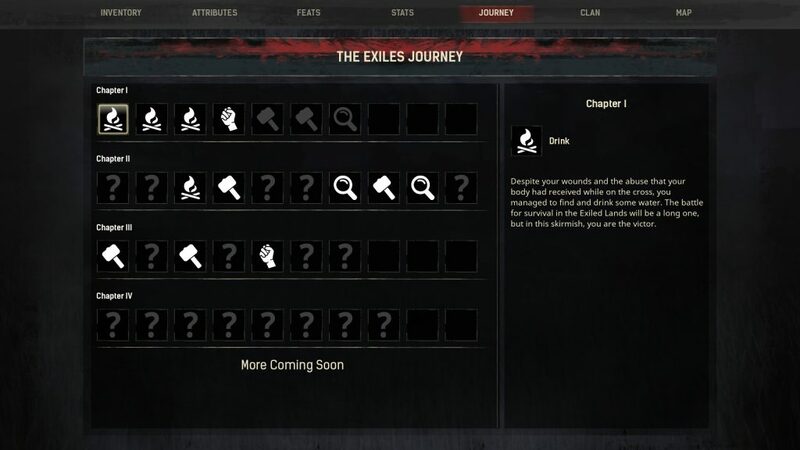 So far during our 12 months of Early Access we’ve put out 32 major updates that have introduced new features, new content, and a whole lot of polish and bug fixes (visit www.conanexiles.com/updates for a full overview). Some of that content represent parts of the greater designs we envisioned. 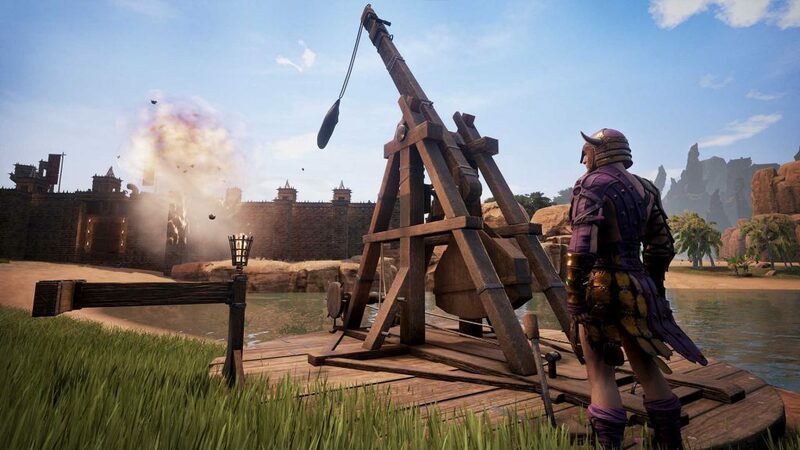 For instance, we have added the trebuchet and siege defense mechanisms, but we have not added things like corpse lockers or siege towers like we wanted to. It’s fully possible that in the time after launch we can return to some of this content and these features and flesh them out further. A great thing about Early Access is that you have the opportunity to organically discover what your game needs while you’re actually making it. New ideas come up and player behavior and feedback tells us what the game is missing (as mentioned earlier, improved combat was the most requested feature in our survey, so naturally a lot of our attention was turned in that direction). There is a lot of content and several features we have added during Early Access that we weren’t originally planning to do, but saw during Early Access that we should be prioritizing. Some of those features and content include climbing, orbs, and the avatar defense domes to name a few. What we do want to make very clear is that we will never lock features we have talked about for Early Access behind paid content updates. If at some point after launch we can implement mounts, sorcery, or any of these features that we wanted to introduce in Early Access, we will make sure these are available freely to everyone. Our focus now is launch and making sure that’s rock solid on PC, PlayStation 4, and Xbox One, and that we make sure as much of the content and features we envisioned make it into the game. Once we’ve launched we can start making plans for what we can add to the game in the future. 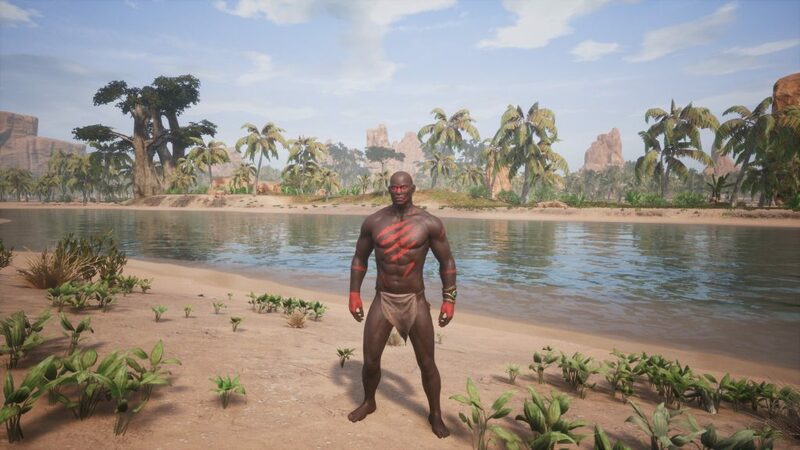 Our hope is that Conan Exiles can live on for a long, long time.